Traced out the existing nut and cut excess of on the scroll saw. 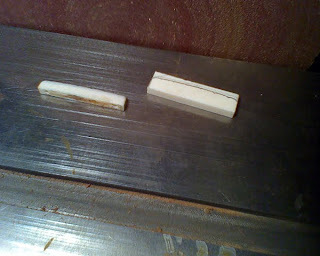 Then sanded the top down top of the nut to match the contours of the other nut. 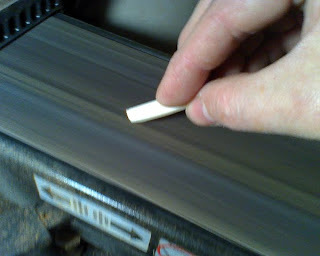 Rounding off the tope of the nut on the sander. 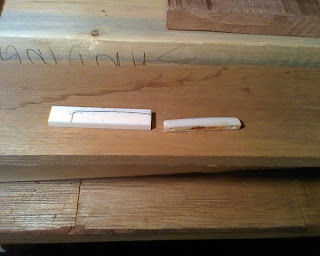 Bone smells bad – real bad – when sanding. I had the vacuum going but it still smelled like burning flesh... gross. 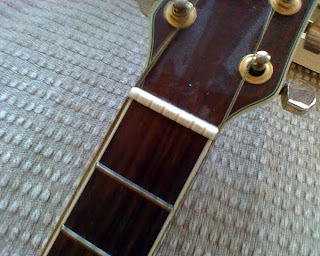 Cut the slots for the strings in the top with scroll saw. Then finished with a scroll saw with a file in place of the blade. This didn't come out very good at all, but I know what I did wrong and can correct fro next time. Installing the nut back on the Charvel. It looks bad but sounds so good. 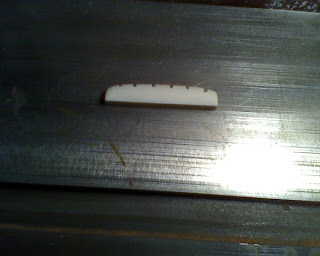 I meant to do the saddle too, but then realized that I purchase the wrong size blank for the Charvel. It will work perfect for the new guitar though. I will eventually end up re-doing this but it was interesting to give it a shot and I'm glad I practiced with this guitar and not the new one.